Of course, I felt for them. It was not that I wanted other mums to suffer in any way but in that moment, I really felt a weight lift. In those times I knew, I mean really knew, that it was not just me that would struggle to peel my screaming child off the floor. But it is not only about the toddler years either. Finding out we are not the only one with challenges at any stage can be a relief. A nine year old hopefully won’t be on the floor throwing a tantrum (hopefully!) but there will be other things to deal with. Seeing or hearing about others struggles helps give us a perspective on our own issues and stops us from feeling so isolated. And let’s be honest here. I know it is not just me. So why do we feel such relief at times like this? and extended families, of course. Everyone one would watch out for the younger members. Whereas, now we are really separated by our affluence. We have our own homes, our own jobs and lives to lead. Whilst there are many upsides to this there are also some downsides, one of which is that we don’t grow up seeing the reality of being with young children. Because we raise our kids on our own more than we used to it is easier to get the idea that other mothers have it all together when we don’t. The thing is that we can all look our best and put on a show for a two hour baby and toddler group but it is only when we see someone for longer periods of time that we see their reality. There is so many tips and tricks out there on how to mange children that it is easy to feel that we ‘should’ be doing better. When our little ones are laying on the floor screaming we can think that we should be able to pull some technique out of the bag to sort it. The truth is that some things have to be gone through. Children all have their phases of development. Intervening in a tantrum is often not ideal. Likewise when our 7 year old is misbehaving at school we can feel that we should be able to stop it right away. Often though dealing with these issues takes time and there is not an over night fix. I go into this more in my post 5 Tips for Repeated Problems With your Children. There is a difference between understanding something and really knowing it. We all know that other children can be challenging for their parents but when it is right there in front of us we can really understand that it is not just us. So my suggestion is that next time you feel that relief or even a twinge of pleasure (mixed with compassion too of course) don’t feel bad. Acknowledge that it is comforting for us all to realise we are not alone. And just know that you will more than likely be providing someone with that same feeling of relief soon enough. Have you ever felt relief or a twinge of pleasure seeing a friend struggling with a difficult child? What was happening that provoked this feeling? Did you feel bad afterwards or was it okay? I would love to hear about your experiences. I reply to every comment. Next > Are You The Family Coordinator? Hi Sarah. It seems uncharitable to say it but I am sure all of us feel this sometimes. Having family to help does make a huge difference. In fact I had one mum say that she didn’t see why a baby was considered hard work. I nearly hit the floor as I had my son at the time. Her situation was there was 5 adults living all in the same place who were happily involved in sharing out the childcare. Doing it on our own most of the time with a partner working involves quite a lot of endurance. Thanks for commenting. Thanks very much. The illusion as you so wisely pt it is a lot of the problem. the thing is we have it in so many parts of our lives with celeb magazines and everyone showing the best parts of their lives on social media. That is what is wonderful about us Mum bloggers. It is hard bringing up children, I have 4 and it don’t get that much esier as they get older, ha.. Hoping over from the blog hop..
Hi Claire. Mine are older and I find it less intensive but they still cause plenty of concerns and have their moments. 4 is impressive, I have to say. I maxed out at 2. Thanks so much for commenting. Hi Rebecca. It is so easy to see others and think they have got it all together but no one does. It is good to know that others are human isn’t it? Thanks for commenting. Hi Lizzie. I think we can all be a super mum for an hour or so maybe even a whole morning or a day. But other than that, no there is no super mum. It is great when we can give another mum a reassuring nod when they are struggling. Feeling not alone is so helpful. Thanks for commenting. I completely agree with you there. The reel of the highlights in peoples lives is very easily misread as being their lives in entirety. It is so easy to compare our inside (how we feel) to others outside presentation. As you point out social media makes this more prevalent than ever. Hooray for Mummy bloggers who often say how it really is. Thanks for commenting. I so agree Helen. There is nothing like that understanding look even if it is just across a supermarket isle. It is so easy to feel alone in those moments but we have all been there in one way or another. Thanks for commenting. It is much appreciated. I always think, there but for the grace of God … We all have moments of parent fail. I think those words as so valuable and have something in them for all of us. We are all just managing with what we have been given. Thank you for bringing this to the front of my mind again and your comment. Yes I agree there.social media has a lot of unrealistic representations in it. It is good to have a reality check and know we are not alone. Thanks for commenting. I couldn’t agree more and that’s why I love reading about other peoples lives in their blogs. I don’t like blogs that paint over the cracks and portray a beautiful, everythings always rosy life. Knowing you’re not struggling alone, doesn’t make your struggle any less but it certainly provides some comfort and reassurance that you’re not doing anything wrong. I agree whole heartedly Ryan. I want something that is real and adds to life through its honesty. We only get a better understanding of life if we are open and honest about all of it. Thanks for commenting and visiting The Guilt Free Guide. Verily Victoria Vocalises recently posted…Ovusense. Because Knowledge is Power. Hi Victoria, that reassurance is particularly needed when things are tough. I remember going through a very tough patch and watching a Michael Macintyre sketch on bringing up children and how people without them had no idea what it was like and even in that I found myself breathing easier and feeling less alone. Thanks for commenting and hosting your linky. Emily recently posted…Guest Post. Tips to avoid a toddler meltdown this summer! Hi Emily. It really does help doesn’t it. I am glad you feel the same. It is not mean just human. Thanks for commenting Emily. Hi Jenny. there is so much to be said for just being heard and knowing you are not alone. Not all problems can be fixed straight away. Thanks for commenting and visiting The Guilt Free Guide. Hi Ashley. Thanks for your comment. None of us are perfect and it is good to know that particularly when things are tough. Honestly when I see a mom who looks stressed or overwhelmed with her kid I want to reach out and help her. I truly feel quite lucky that my kids don’t throw tantrums in public. I have pretty well mannered kids even for being 3, 4, and 5 years of age. So when I see a mom struggling I truly want to just help her. My kids tantrums are revealed at home and there are some days I just wish I had a timeout …10 minutes to sit in silence and think. No village here. Thanks for sharing another great post with me at #momsterslink. Hi Trista, I likewise do feel for them. I always attempt to give them a reassuring nod or comment so that they don’t feel alone in that situation. It is so hard in public to cope with, particularly when some people are not supportive but rather the opposite. I like your idea of a parent time out. Here in the UK anyway a ‘time out’ is for kids who are in trouble but sometimes as parents we would love a bit of time to get away and re charge for like you said some thinking space. Thanks for commenting Trista. I’m totally with you. Nothing better than when your kid is being a nightmare and someone tells you there’s is just the same. Phew, I’m not a terrible mum! Phew all round! I always make sure I tell women if I have experienced the same or similar because it was such a relief to me. Standing together in motherhood is so helpful. Glad it was helpful. Thanks for commenting. Hi Kaye, Most parents have experienced difficulties with their children when they are out but it is so easy to feel judged. It is good when when we know we are not alone. An acknowledgement of helpful look when we are out is so helpful. Thanks so much for commenting. It really is isn’t it! Knowing it is nor us is reassuring because it can feel so pressurising at times. Thanks for visiting The Guilt Free Guide and leaving a comment. I think every parent, especially mothers, go through feelings of guilt or inadequacies. In some ways this is positive, as it shows we want to improve and do right by our children. But we should try to switch off those nagging thoughts most of the time, which isn’t always easy. Hi Carla, You are so right. We need to be pleased with ourselves that we care so much but also be able to identify where those thoughts are unhelpful. Thanks so much for your astute comment. Hi Zoe. I agree. It is not helpful to compare how we feel with how others present themselves. Who knows and actually how can we compare? We cant as no one is the same. Having post natal depression makes it so hard to feel okay about the mothering we are providing. Many of the mothers I interviewed for my book who had it were being a mother under great internal (and in some cases external) duress and I was impressed with how they got through. It is so hard to acknowledge our own strengths at times like this particularly when we feel we shouldn’t be depressed because we are mothers. Thanks so much for commenting. Hi Nige. It is not easy to say for fear of it being taken the wrong way but it is something that everyone I have spoken to has felt. Thanks for commenting. That is exactly what it is Jemma. The load lightens in those moments as we understand we are not alone. Thanks for commenting. I am totally with you on this one, so much so I have kinda flipped it. I know how much I benift for the realisation that others struggle with my kid stuff too! So now whenever I see a mum trying to shhhhh her screaming little one at the check out, or a dad trying to convince his daughter it really IS time to leave the park, I just smile and say I’ve been there, it doesn’t last for ever! I promise. Hi Claire, That is just what I do. Even a consoling look in times like those is so helpful because it is just not easy. Keep up the good work!! Thanks for commenting. I so agree with you on everything you have written. The mummy bloggers are amazing and I really wish I had known about this when my boys were young. It would have helped a lot to read about the realities, from a personal place, of other mothers. Mummy bloggers rock when they share the warts and all of raising children!! Hi Kerry. I am so glad it resonated for you. Thanks for commenting. Hi Melissa, We feel relief and sympathy at once. There is great power in knowing we are not alone. Understanding the experience of others brings us the reality check we need. that is why I love Mummy bloggers who personally tell their experiences, highs and lows. It is wonderful to have that perspective and counter acts much of the highlight reel of peoples lives from other social media. thanks very much for commenting. It is much appreciated. It can be hard to admit cant it Luke. But it is so normal to feel that way. Thanks so much for visiting The Guilt Free Guide. Hi Rebecca, Thanks. Looking forward to reading your post on being an introvert. This is so true, Kirsten. Seeing another parent struggle feels like a weight is lifted off my shoulders, that somehow (like you said), it’s a confirmation that I’m not alone in my journey. You’re right in saying that it’s so easy to believe other parents have it together, but a two hour window is far different than being with them at their home, with their children and away from the prying eyes of other parents. I think the most important to keep in mind here is that no one is perfect. We’re all trying our best and though it may seem like we’re all alone in our path, there are others out there that have been through it once, or are in the trenches with us. Thanks for the reminder. This was such an eye-opener for me. Have a good rest of the week! Hi Maria. Thank you so much for your lovely comment. I do really appreciate it. I have had so many responses to this post and it seems to have struck a common feeling that we all have but that is difficult to mention for fear of someone taking it the wrong way. I so agree that holding in our minds and our hearts ideally that no one is perfect helps us very much with the experience of motherhood. Our best is all we can do and we learn and grow throughout our time as parents. Being open to that and accepting it is very important. Hi Erin. I agree. When I was first a mum I thought ‘It cant be this hard, I must be doing something wrong’ Going to meet other mothers taught me that I wasn’t doing it wrong but that we are all challenged at times, sometimes many times a day (particularly with young children). Thanks for adding your voice to this discussion. Totally agree. I think in this time of social media, people share the good but not so much the bad, so people often get a skewed view of other people’s children, and to see them having a tantrum or something rather than a posed photo is enough to make you realise everyone has these issues. I am there with you. Social media as a stream of the highlights of everyones lives can give a very distorted picture of reality. Thank goodness for the many bloggers out there who tell it as it is and add in the much needed realism. Thanks so much for commenting. Kerry-Ann recently posted…C is for Cows are Comfort Eaters Too! Hi Kerry-Ann, We are all winging it in many ways. We have to react to each new things that presents itself. It is a hard topic to talk about for fear that some people will take it the wrong way but actually (as all these comments attest to) it is such a common feeling to have. Hi Ellie. when we see another parent struggling we can hold that in our mind when ours are doing it and it really helps. Thanks for commenting. It is much appreciated. Great post!! I definitely think all parents can relate to this! It’s nice to read that others feel this way too. It is of course not nice to see others struggling but it does give reassurance that it isn’t just us. Not that we are taking joy out of seeing their kid throw a massive tantrum or some other “bad” behaviour, just that it helps us realise that we aren’t bad parents ourselves and we all go through the same trials and tribulations with our kids! Thanks for sharing this post I really enjoyed it! Exactly. It is that perspective we get. It is so hard to verbalise that feeling for fear of someone taking it the wrong way. It is not about enjoyment. And so many others do feel the same way as these comments attest to. Thank you very much for letting me know your own experiences. Thank you Berg. I really appreciate your kind words. I am glad you found it insightful. Hi toni. I so agree. It is not that we want others to have things worse than us but it does give us a perspective on our own situation that is hard to have otherwise. Thanks very much for leaving a comment. Thank you very much Mackenzie. I am glad you thought it will be useful. Thanks for commenting and hosting. It is ideal to stop comparing ourselves to other people but for many it is difficult. Thanks for sharing your Mummies views. The last line… yep, that was me today! Great post, all so true. We have all been there. Glad the post resonated with you. It is nice to know we are not alone. Trista, Domesticated Momster recently posted…What Do Bloggers Actually Do? Hi trista. Thanks for visiting. I have never been on this linky before. Have a great week. Another great post Kirsten. I have to say I have always felt massive relief when I have seen other parents struggle when I have been going through tough times, but I’m also quick to reach out to other parents openly struggling to let them know that I too have struggled and that this too shall pass. It’s so good to hear that when you’re struggling isn’t it. Thanks so much for linking up to #wineandboobs! Hi Talya. You are like me. I make a point of giving a sympathetic look or a few words of comfort. It can make such a difference in that moment with a screaming child to realise that others around you understand. Thanks for commenting and also hosting. this is a good post, and I am sure we all have that moment of relief when we see another parent dealing with a meltdown. I know I do, especially when I know I didn’t deal with my own kids’ meltdown as I should have done – we all struggle at times! Hi Sarah. I am glad it resonated with you. We do all struggle at times and we often think we should have done better, but that is part of the learning process. Thanks for your kind words and commenting. I think that sometimes we set certain people on a pedestal and believe they can do things better than us. Social media certainly adds to this with the picture perfect lifestyles displayed for us all to see. When we see someone struggling it helps us to see the true picture and it makes me feel better I admit! It is an uncomfortable one to admit isn’t it. We of course feel compassion and all those other feelings that come with the situation but that element of relief is quite common. It makes us feel not alone in our endeavours. There is a role of the arts in helping us feel not alone by the sharing of suffering but now as you say there is so much in social media that is really an untrue representation because it is just the highlight reel of someones life. Thanks for adding your voice to this discussion Catie. Agree totally. The worst feeling is when you are having trouble and everyone else seems to be sailing through motherhood. It is great when you realise we all have our ups and down’s and nobody’s perfect. A reality check really helps us. It is so easy to compare how we feel to how other people present themselves. you are so right that all parents have ups and downs and it helps us once we really know that. Thanks so much for your comment. Sometimes I think parents ‘act’ as if we are coping in order to feel that we are – it’s ourselves we are trying to convince as much as other people…..
Anita Cleare recently posted…How can I help my child sleep through the night? That is such a great point and something I have thought about. Even when we are struggling it is good to put on some make up and go out to meet with other parents and just feel normal. Thanks for adding your insights to this post Anita. good to know I am not the only one who finds relief in other parents struggling. I find it more satisfying when its the parent who lectures you on how wonderful their child is and you need to parent like them. Hi Nicole. I am glad it resonated with you. You have really made me laugh too. It is so satisfying to see a parent who lectures you struggling I agree but it is another emotion altogether:-) It too is a very common feeling and it is lovely. Thanks for commenting. I am really looking forward to reading your recent post on the common misconceptions about having boys. I am so glad this reflects something you experience, Amy. It is a reality check right in front of our eyes and it is a relief to really know we are not alone. Thanks for commenting. Hi John. Many of us feel empathy too but relief as well at times. It is an interesting observation that as women we might feel under more pressure. As you can see from all the comments there is an overwhelming response that people do feel relief, some Dads too. It is a good place to be not to feel that because it is reflective of not feeling under pressure to have things sorted. Thanks for adding your perspective. I am so fascinated as to the attitude differences between SAHD and SAHM. I wouldnt want to stereotype anyone but we all bring different skills to the role. In the Philippines I have an army supporting me during my pregnancy and when I gave birth. I have tons of relatives who lives near my house who are always visiting me and helping me with my son. When I moved here in the UK, I only have myself. And when my husband is home he helps. But most days its me and so true that I feel better when I see some parents struggle cuz I know that its hard and its not just me. Hi Merlinda. I think that like you suggest it is only when we are struggling that we feel that relief at all. It is great to know we are not alone when we feel stretched ourselves. Thanks for adding your voice to this discussion. With an almost certainly autistic three year old who pushes me to my limit on an hourly basis (at least), it often feels like I’m the only one struggling. It’s *such* a relief when I see others do struggle, too. I am glad this rang true for you. It sounds like you have your hands full and that is tough emotionally. You are not the only one but motherhood can be quite isolating even more so when your child doesn’t fit the usual mould. Thanks for adding your voice to this discussion. It is appreciated. I have had that situation too. A very unhappy child is so difficult on everyone involved and I felt this more than ever then. It can be isolating and is such a relief to really know you are not alone. Thanks very much for commenting Hannah. Best of luck with the tantrums. You will develop a tolerance for them. Over time I actually got to feel good about how i managed them even though they were never pleasant. If nothing else I guess it makes us feel that we are normal in a non-judgemental kind of way, especially in those early days when we aren’t sure which way is up. I guess it relates to general every day life too. How many times have we have said with relief “oh, I’m so glad I’m not the only one that does that” when we’ve felt a bit foolish. It is very true that there is safety in numbers! You are absolutely right there Nicky. It is there in general life. the more pressure we feel under the more we are likely to feel it. It is very common feeling clearly as demonstrated by all these comments. This is perfect! I’m not going to say I feel good seeing another mom struggling, but I definitely feel less alone. My child always seems to be the one who acts out at mommy & me classes and I’ve always felt that I just have an extra stubborn child – more stubborn then others – which leads to him acting out and throwing tantrums just about everywhere we go simply because he doesn’t get his way. I always feel like *that* mom, and nobody likes to be *that* mom. So when I see another mom with a child that behaves the same way mine does, I definitely feel not alone and very sympathetic towards her. Hi Lisette, It is so hard to feel the one who is standing out. We can feel many of our fears and insecurities surfacing in those moments. Then, as you said, we see someone else struggle and we know we are not alone. There is sympathy in there too of course. If it is any consolation I felt I got better at coping with tantrums and got to the point where I was proud of how I handled them. I didn’t every enjoy it but I learnt to not dread them. And of course they do grow out of it. Best of luck. Keep being okay with yourself whilst it is happening. Fab post! I completely agree. It’s refreshing to know that there’s no perfection. 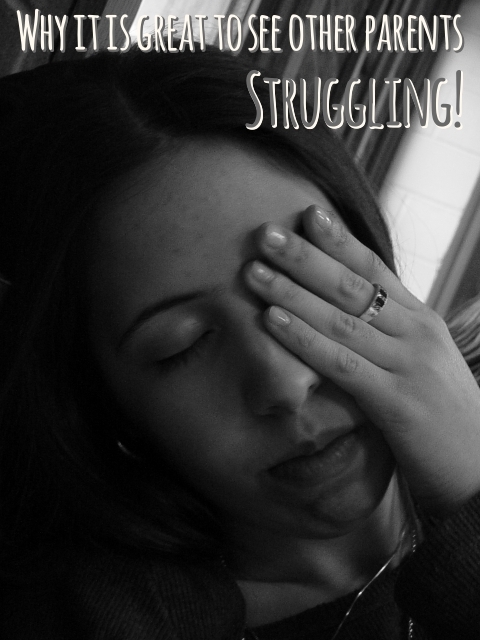 I did a post before Christmas called confession where I literally said I was struggling. The amount of thank yous and heart felt words were fab. Parents struggle. We all do. It’s goo to see that we’re human. Thanks for linking up with us on the #bigfatlinky hope to see you there this week. Thank you Martyn for your kind words. I have been blown away by how supportive the blogging scene is, just as you said, it is amazing. Knowing we are not alone is so helpful. We desperately want to be the best we can for our kids and it can make us hard on our selves. When we connect with others or see them struggle we get a reality check that we are okay. thanks for commenting. I totally agree with you. Enjoyed reading this post. I feel some kind of relief seeing other children having tantrums as it does show it’s not only my children that do it! Hi Beth. I am glad this resonated for you. All children play up, but when it is demonstrated in front of our eyes it makes it truly real and it is a relief. Thanks for your comment and your wonderful linky. Yep. I try to stay very authentic and transparent about parenting struggles for just this reason. My pride wants to put on the “perfect” front at times, but I think it is so important to let other mommas see real life. Usually when I’m honest about the dishes in my sink or the toddler tantrum in the store, it allows the other mom to lower her guard, relax, and share her own struggles–and we can both grow and encourage one another. Hi Carrie. This is such a great thing to do. I do the same. You are the first person to identify the ‘pride’ side of wanting to present ourselves as always coping. It is such an important factor but you are so right it helps others when we show the truth and it helps us too, because people can connect with us in a way they otherwise wouldn’t. Thank you for your insightful comment. I totally get this! Sometimes I’m relieved to see another child behaving as wildly as my own toddler, because it reminds me that this experience is universal. We’re all in it together, even if it doesn’t always feel that way. Thanks for linking up at the Manic Mondays blog hop! Hi Meredith. Motherhood is a great uniting force when we realise that we are all experiencing the same things. It helps cross age and cultures when we really understand that it is a shared experience. I am glad this rang true for you. Thanks for commenting and hosting your great linky. You make such a valuable point! It’s essential that we share our struggles as well as our successes, because how else are we, as a community, going to be better? Thanks for linking with #TwinklyTuesday! You are so right Sadia. We improve through an honest assessment of our difficulties and by learning through others. It can be that we learn new skills or it can be that we learn a perspective that we didn’t have before (like we are not alone). Thanks for your insightful comment. I also am relieved when I hear or see others struggling with their children. It’s like you said: pffew… I’m not the only one. I noticed that others can see us as the perfect family. They mention how I seem to have my act together and things always go smoothly with the kids. I stopped smiling and thinking “if only she knew”. I say it outloud now. And ever since I admit things are not so perfect as they may seem, other parents start talking to. We now don’t only share our succes but also our frustrations. And it feels good to know you’re not the only one. Thank you for this Miep. You are so not alone in feeling this way as all these comments attest to. It is great that you now say out loud that things can be a struggle. You are helping those other mothers more than you might know. It also makes us more real to others and helps us bond over the shared experience of motherhood with all its ups and downs. Hi Jenny, It is a tough one to admit even though it is perfectly normal to feel that way. As you say it can be so overwhelming having children and we want to do things really well for them. I am glad it struck a cord with you and has helped. Thanks for hosting your fab linky #sharewithme and commenting. It’s so important to actually see that you are not alone, that EVERYONE finds parenting hard! Thanks Lora. I am glad it rang true for you. And we do all find it tough. Hi Zena. I remember those days. It is not easy to be in those moments. They just have to be gone through because toddlers demands are impossible. some days it doesn’t matter how much you give they will still keep demanding until they hit a ‘No’ and then have a melt down. Often it is not easy watching others in that situation either but it can be a relief too. Thanks for commenting. Best of luck with future meltdowns. It is not easy to admit but as these comments testify to we all feel sympathy but some relief to. Knowing we are not alone at times when we are struggling is so helpful and relieves the pressure. I am glad it was of use to you. Thanks for commenting. I don’t enjoy seeing others fail but it helps to know we all struggle and it sure is good to chat and talk and support one another. Being a mum is hard work and it’s good that we can acknowlegde this without feeling judged or being told we are bad! Hi Angela. It can be a relief cant it. As much as anything it helps us stop judging ourselves and holding ourselves up to the idea that everyone else has it sorted. Like you I think that one of the best things we can do as mothers is to be honest and share the realities of the highs and lows. Thanks for commenting. It is much appreciated. I think this is so true. There are some cultures today that still practice the whole “It Takes a Village…” notion (I see that you’re from the UK, in the US we parent the same way you described in the post)–I think they are called “collectivist” cultures, meaning they tend to put the group before the individual (opposite from the “individualist” cultures, such as the US & UK, that value personal accomplishments, success, etc.) It’s no wonder our parenting practices get integrated into this idea. This post helped me feel better about watching other parents struggle…you’ve shown me that it’s not that I’m a mean, bitter person, it’s just that I don’t to feel like the ONE person who’s “not getting it,” which of course, is mostly in my head! Thanks for writing…your blog is just the type of posts I look for! Katie Greulich recently posted…Come Read My Work at Mamalode! Hi Mummyitsok, I think it is quite common to feel both relief and sympathy to exist at once. Motherhood is not easy. Thanks for your comment.